The plot is very predictable. The movie more or less opens with the news that the British Prime Minister has died in totally normal circumstances. The heads of state from around the world then must attend the funeral. And there you go; you can guess the rest of the plot from then on pretty easily. They are all killed except President Aaron Eckhart and security man Mike Banning (Butler). What follows is a gross series of setpieces as Butler stabs, shoots and tortures his way through London. There is a subplot about a mole in the British government helping the terrorists pull off their (frankly ludicrous) plan but it’s handled so poorly it may as well not exist. As I said above, the bad guys plan is ridiculous. They somehow manage to infiltrate the police and the Queen’s guard without anyone noticing. Then they position themselves in a way to kill all of the world’s leaders. I know I said that they had a mole in the British government who helped them, but you can only suspend your disbelief so much. But the reasoning behind the attack makes sense. The leader of the bad guys is a nasty bloke; he sells weapons and kills people etc. He is angry and seeks revenge because the US killed his daughter and a lot of his family at her wedding, with a drone strike. A good reason to be angry at the government, and this could have sparked an interesting debate about drone warfare. But no, they never use it. And to add insult to injury they kill the villain at the end of the film by bombing his village with another drone strike. It feels very much “Yay go America!”, even more than the first film. I’m not saying London Has Fallen is racist, but it veers into extremely uncomfortable territory at times. Like when the president is about to be beheaded on a live stream around the world. Also the fact the film expects us to cheer and applaud when a Middle Eastern town is bombed or a terrorist is tortured. It’s difficult to feel glad when a man is stabbed a hundred time in the chest, especially when the film hasn’t quite earned that hatred of the bad guys. The villain is horrible sure, but the government killed his entire family at a wedding and never even mention it. Don’t expect me to be happy when he’s killed by America’s military might. It might be a very clever satire of America, but I’m not so sure. Somehow despite all of this, I still loved the film. It felt like a throwback to violent films of the 80’s like Rambo especially Rambo 3, where Russia is the cardboard cutout villain. 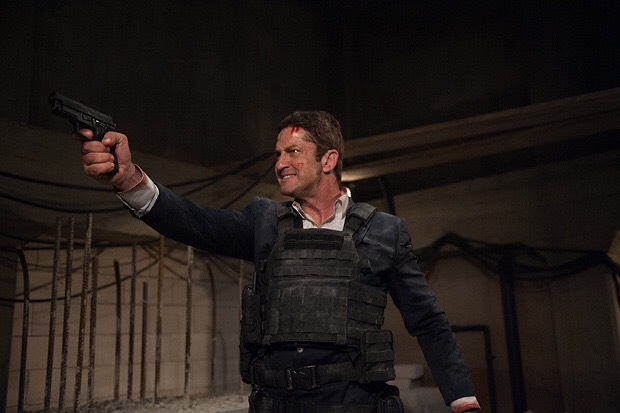 Maybe calling it racist is giving it too much credit, it’s Gerard Butler shooting people for and hour and a half and that’s a-ok. Speaking of, Butler is fantastic. Spouting off one-liners like the best action heroes. There’s also a odd ‘coming out of the closet’ joke that just feels childish in 2016. But maybe that’s just Mike Banning, he’s also a throwback, this time to the stereotypical action hero of years gone by. Eckhart is suitably reliable as the President. The supporting cast is just wasted however, with famous faces like Morgan Freeman, Robert Forster or Jackie Earle Haley relegated to spouting cliché military jargon in a back room somewhere. Angela Bassett is awesome in her limited role however. The action in this film is a lot of fun. As soon as the world leaders start getting blown up and the shooting starts, it doesn’t stop. It’s violent, which is nice in this era of 12A rated Expendables films. Banning and the President get across London by helicopters, that crash, and in cars, that also crash. The scenes are silly, and the CGI is questionable but I was smiling throughout. There aren’t high stakes behind it, you know they’ll get out ok, it’s more about how many faceless goons Banning can take out and how is he going to do it. As long as you don’t ask any questions and just enjoy the explosions and gunfights then you’ll enjoy it. There is one standout action sequence and it comes towards the end of the film. After Banning meets up with the SAS he storms a building to save the president. It’s all done in one astoundingly long, uninterrupted take as Banning shoots and climbs and runs through about hundred bad guys. Ok, it might have been thrown in there because uninterrupted action sequences are ‘in’ right now, and the transitions where they’ve spliced it together are more obvious than The Revenant or any other film that has used the technique. But it’s still a crazy inclusion in a film this dumb and I respect the filmmakers for that. And it gets the breathless, crazy feel of the scene just rights with soldiers dropping on both sides and cars and building exploding. 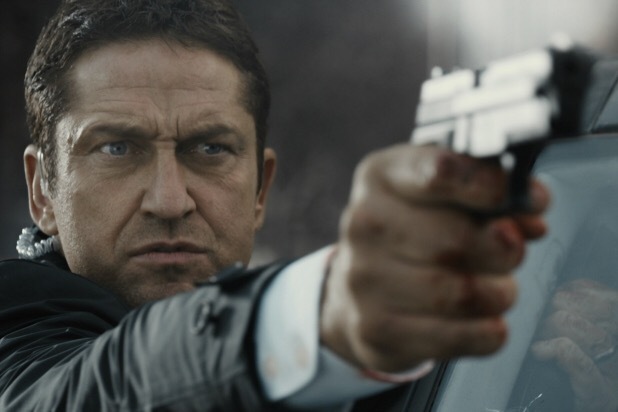 It might appeal to the Trump crowd for all the wrong reasons, the plot makes zero sense and it has atrocious CGI, but London Has Fallen is still worth your time. When people say a film is dumb and you should ‘turn your brain off’, or it’s just ‘popcorn entertainment’ they were talking about London Has Fallen. Is it 3 o’clock in the morning, are you awake and looking for a film to entertain you? You could do a lot worse than London Has Fallen.